Welcome back to the second of this month's inspirational instalments from the Our Creative Corner team! Thank you so much to all of you that have taken part in the 'Recipe' challenge so far. There has been another really great response and all the team have had so much fun visiting you all and seeing what wonderful creations you have shown us. The first two weeks of the challenge started with half of the team showing you some creations to lead you on your way down your own creative path. Now the rest of the team are here to provide you with even more inspiration! Before we do that, here's a quick reminder of the Recipe ingredients list (remember, you need to use at least one from each list). 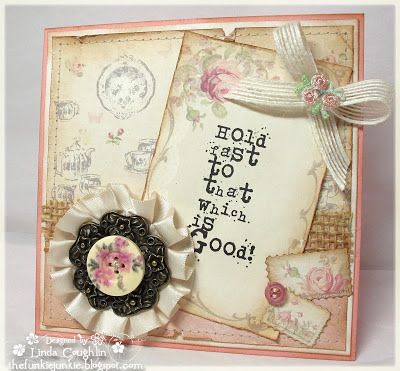 I was delighted when I saw the challenge that Jenny set for this month as it meant that I could do one of my favourite chunky ATCs from a woodblock. I chose Paris for my theme and the wonderful Prima Engraver papers to match a crystal knob I have wanted to use for ages. What a yummy challenge Jenny has set for us this month - so many of the choices are right up my alley! With my crafting time under pressure through only being with my stash for half of each week, it's great to make something purely for the sheer joy of it... so Jenny's Recipe challenge gave me the perfect opportunity to just play with lots of my favourite things! I created this tag inspired by some images of torn old wallpapers, peeling off the walls, letting show the various layers of old wall paints through with some areas... a kind of beauty in decay which I love very much as it tells a story about the nature of life in general. There are two more weeks of this challenge left, so why not have fun creating whatever takes your fancy using ingredients from each list and join our Recipe challenge. The deadline for this challenge is Friday 28th June at 11.59pm. The winner and Top 3 from this challenge will be announced on the 8th July. The winner will be invited to appear as 'The Top Talent' here at OCC, have a short interview (so we can find out all about them) and there will be a 'Spotlight' on a new project they have created. The winner's Top Talent interview and creation will be on the 22nd August. Make sure you join us again for those dates and remember that the next challenge will go 'live' on 1st July when Linda announces her theme. Come and see what surprises are in store for you and where your next OCC challenge journey will take you! Welcome back to Our Creative Corner! Last month was 'Anything Goes' and we had such an immense response! It was wonderful seeing so many creative entries. There is so much incredible talent out there - I was amazed by what everyone created. Thank you so much to everyone who took the time to share their wonderful work with us - I wish you could have all won this month - You are all so talented. As this was the challenge that I hosted it was my job to judge the winners. Judging this was always going to be so difficult - 720 entries!....and I could only select 4! 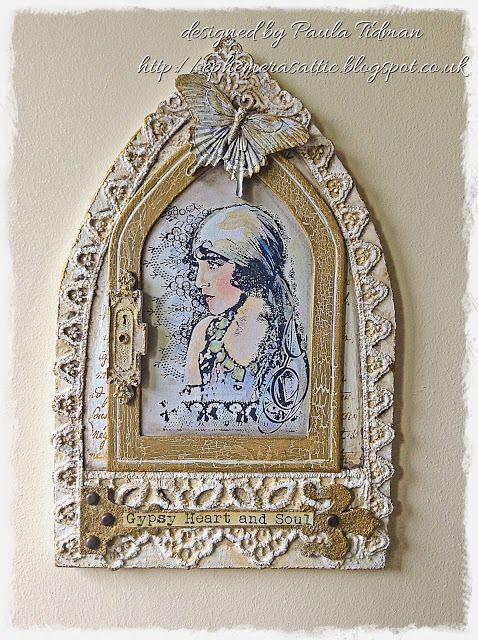 This gypsy plaque is gorgeous! 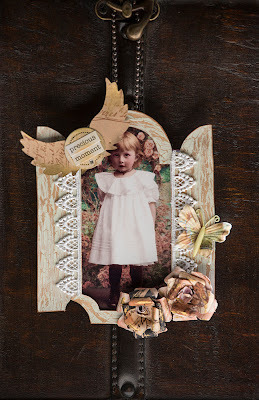 - I love the faded colours in the stamped picture and the subtle vintage colour scheme. The crackle effect and script are beautiful and I adore the lace and how it looks like it is part of the wood. Congratulations Paula! And now the Top 3! Well done to all of you! This bird decoration is amazing - Such an unique creation - I really love the tarnished metal paint effect. It certainly inspired me because I want to make one of my own now! This is such an amazing transformation! 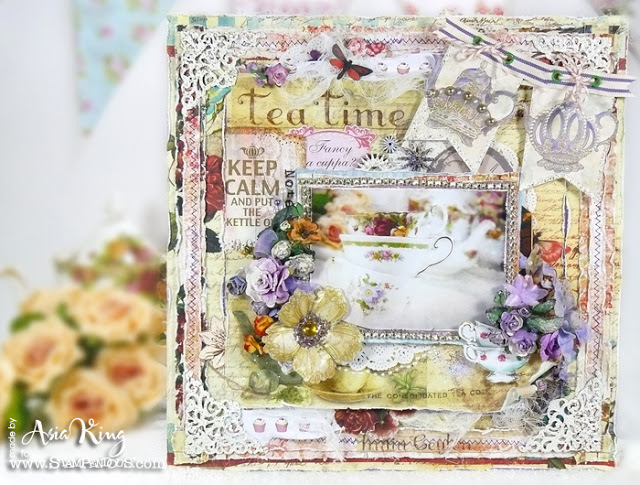 This scrapbook layout is adorable! I love the delicate layers and gorgeous shabby chic look. It really does capture the atmosphere of a glorious summer afternoon and of course the traditional afternoon tea! This page is truly wonderful! - I couldn't stop looking at it as there is so much to see! I loved all the bright colours and the variety of textures. This is such a fantastic piece - full of detail and creativity. Don't forget the new 'Recipe' challenge! - Come and see what it is all about and please join us. You could be joining Paula in 'Our Winners Corner' next month and being invited to create something for us and feature as our Top Talent! Welcome back to Our Creative Corner. Jenny here to host you for the month of June. On behalf of the Design Team thank you all so much for the magnificent response to our first challenge 'under new management'. We thoroughly enjoyed getting to see the 720 entries which were varied and so creative. Picking a winner is going to be very hard indeed! We hope you will enjoy this theme as much as the last one. So, how to get involved. You need to choose at least one element from each list below and include them in your project. If you want to add more that's fine, go for it! What you do with them is up to you. 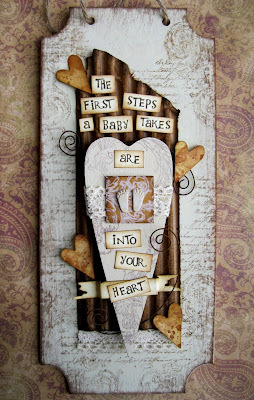 We'd love to see your tags, altered art, mixed media, journalling, 3D art, ATC's, and cards. It would really help if you could list the ingredients you've used to make judging your fabulous entries easier. Bring your creations to Our Creative Corner and you could be our WINNER! (Please check out the rules at the end of this post to make sure your entry can be accepted). The winner will be invited to appear as 'The Top Talent' here at OCC, have a short interview so we can find out all about them and there will be a 'Spotlight' on a new project they have created. This will take place on 22nd August. We have a page on this blog called 'Winner's Corner'. The winners name will be featured on this. For entrants who have won our challenges and been featured as 'Top Talent' three times there will be a very special 'Gold Winner' badge for you to display proudly on your blog - now there's a challenge for you. Of course, there's only one way to collect your badges and have your name placed in 'Winner's Corner' for all to see - let's see your entries! 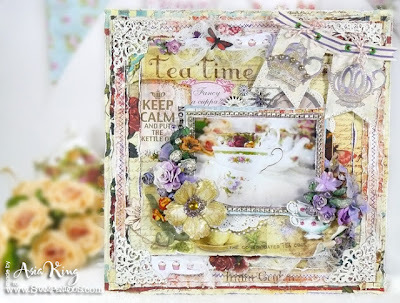 Remember, Laura will be back on the 8th June to announce the winner of the 'Anything Goes' challenge, and on 15th June the rest of the Design Team will showcase their creations for this month's challenge. So now it's time to see what the first half of the Design Team have been up to. Totally intrigued by what everyone else was doing with crackle, I wanted to try this on my project. As I was away on holiday, I packed everything I needed from 'the list'; lace, metal, paints, etc. as well as the crackle fluid. Then I decided I wanted to make a shrine. Miles from any craft shops, no time to order on the internet, I had to revert to basic skills and make my own shrine. Here it is, and if you'd like to find out how I did it pop over to my blog. Hope to see you there! As host of this challenge I went for the 'use everything' approach to see where it took me. Don't panic - you don't have to do this! Thankfully the generous Tracy Evans had sent me an untreated wooden pot as part of a clear-out competition she held recently. I set about transforming it with all of the ingredients listed in the table above and now have a rather useful and elegant pin cushion/pot. It took me back to my days of upholstering my Nana's dining chairs and making curtains many moons ago. For some close ups and a brief step by step hop on over to my blog. My starting point for this piece was a beautiful stamp depicting part of a painting by John William Waterhouse. I am a huge Waterhouse fan and had this particular stamp plate on my wish list forever! I chose fabric, clay and paint as my main ingredients. If you hop over to my blog you'll see all the other ingredients I chose from the list too - I never seem to know when to stop.................................! ....... and for once not a flower in sight!!! 1. You may enter this challenge a maximum of THREE TIMES - they must be different creations and posted on your blog separately. 2. If you post any more than three entries they will sadly have to be deleted. 3. NO back-linking. Please do not enter a creation that was published on your blog before the start of our challenge. 4. Please link to your actual post, not just your blog. If you just link to your blog the team will not be able to find your entry and leave any comments. 5. Please include a link to our challenge in your blog post. 6. You may combine our challenge with as many other challenges as you wish. 7. If you want the team to comment on your entry then you have to link to a site that does not require us to sign in/become a member. This challenge is open until 11.59pm Friday 28th June.